Before the app can communicate with the ECU, there are a couple of changes to the settings on the ECU that need to be made. Open DTASWin, load the map from the ECU as normal. 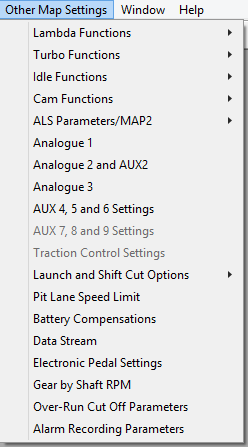 Then navigate Other Map Setting -> Data Stream. This opens the Serial Data Output for Dash screen. 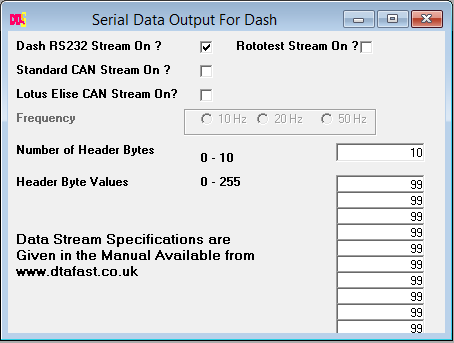 Make sure the Dash RS232 Stream On box is ticked. In the Number of Header Bytes, set the value 10.Then set the ten header byte fields to the value of 99.